(Chuo-ku, Osaka, President: Junji leaf field headquarters), Inc. One2Touch (NASDAQ: Norway, CEO: Oyvind Holtedahl) was planned and developed in collaboration with, “NFC IP-the international standard for short-range wireless communication Elecom Co., Ltd. will be released in late August, the new TK-FNS040BK “” silicon keyboard equipped with NFC technology that conforms to the “1 (ISO / IEC 18092). One2Touch Inc., a technology venture company who was founded in Norway in June 2009, meet, touch & type technology, the company’s patent application has been around the world. 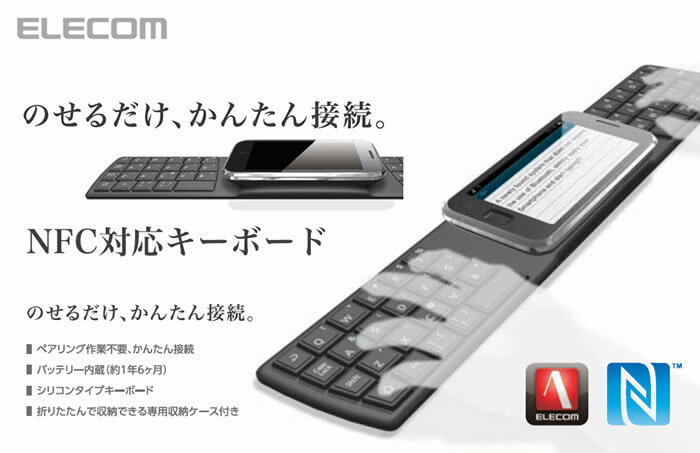 Elecom Corporation and its One2Touch was planned and developed in collaboration “compatible keyboard NFC: TK-FNS040BK” finally comes into play. Keyboard “TK-FNS040BK” NFC-enabled is compliant with NFC IP-1 (ISO / IEC 18092) international standard for wireless communication, is a silicon keyboard that can be used by short-range wireless communication. Has to be able to keyboard input and not corresponding to the same standard Android smartphone, you can connect the cable. Also eliminates the need to set up pairing of Bluetooth?, Is a breakthrough in the character input can only give the smartphone in the central part of the keyboard (※ 1). Using the radio frequency of a band 13.56MHz, can be used at a distance of about 10mm from the surface of the keyboard (※ 2). 6 months is available with built-in battery for about 1 year (※ 3 · ※ 4). It can be folded into compact, easy to carry. Special case because the keyboard can be stored convenient portability and storage included in the further, folded, there is no worry about scratches on the keyboard, you can feel free to carry the card in a bag. Also, such as road, can be used conveniently to input text on a smartphone, such as e-mail reply. The key type is, has adopted a key sequence of the original 45. The keypad feels well, has adopted the key silicon out smooth comfort. You can use a free download from Google Play Store “powered by ATOK Japanese input ELECOM”, conversion accuracy, speed is improved significantly, with comfortable text input enables smooth. ※ 1:	Software installation and configuration is required only prior to use. After installation is available only in place. ※ 2:	May cause your environment, a different distance. ※ 3:	Test is the value of our environment, but it is not a guaranteed value. Make sure that you have assigned to keyboard operation eight hours a day. ※ 4:	Built-in battery charging and exchange is not possible. If the capacity of the internal battery has expired, you can no longer use. Please acknowledge it beforehand.